A battle is the heart of every adventure, and the fighter is the lord of battle. Let the casters weave their spells, let the priests say their prayers, for only the fighter can withstand the dreadful assaults of his enemies and claim victory over them. 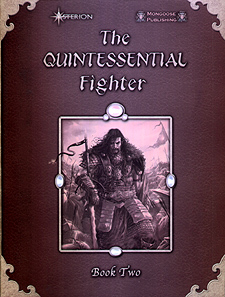 If you want your character to stand at the forefront of battle, implacable, indomitable, The Quintessential Fighter is the book for you. Within this book you will find a new origins system to create your character's background and grant him unique bonuses, new character options, more than 70 new powers, unbelievable combat styles and martial rituals, 14 paragon paths, many feats, and weapons, armour, and magic items that will help you build a matchless arsenal. This book also contains information on martial organizations that can liven up your campaigns and fantastic arenas in which to enact epic battles.